The family took a road trip to Souris on Labour Day. It's almost three hours to drive there, so I took some knitting with me (I wasn't the one driving). It's the Tangled Yoke Cardigan I've been working on, though I suppose one could call it the Tangled Mess. I'm going to come clean about this project, as the knitting group is starting to snicker every time I mention it. I decided in late spring that it was time to make myself a SIGNIFICANT PROJECT. No more hats, mitts, scarves and the like, but a real commitment. A commitment to myself and (for shame) to the size I currently fit. 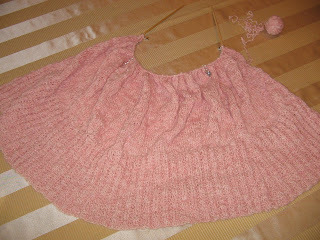 I chose a pattern from Fiddlesticks Knits called Caress.It was so pretty, all soft and flouncy. I began this project and finished the back, both fronts and both sleeves. I still had to make the large, flouncy border around the edge, when I decided that it was really all wrong for me. Too soft, large and flouncy of course. So I unraveled the entire work. 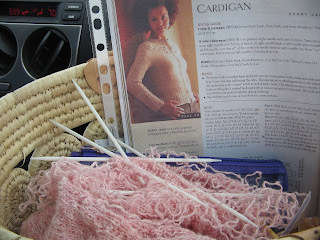 Then I decided to knit the Katherine Hepburn Cardigan from the book Lace Style. Well, I decided, instead of kntting the back and fronts separately, I'd be clever and knit them all at once. So, off I went with something over 260 stitches on my needle, and knit , knit, knit the first 10 rows when suddenly I realised (this was late at night) that I had reversed the directions of all the cables. I left it overnight and first thing in the morning, I unravelled the entire work (without looking at it first). I started the same sweater again, but rather than be clever, I only cast on for the back this time. Well. 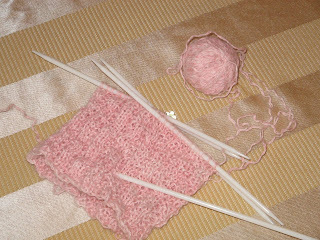 Of course, I reached to the end of 10 rows and realised that the original cables had been all correct to begin with! A little bit disgusted, but undaunted I continued up the back. After about four or five inches I had a good look at my project and decided the pattern, though it would suit me fine, really needed to be done in a cotton or silk yarn that would give good stitch definition and the alpaca I was using was just too soft and fluffy for this pattern. Yes, I unravelled the whole work. Again! When the Interweave Knits Magazine arrived in the mail I knew immediately that the Tangled Yoke Cardigan was perfect. It needed a soft touchable yarn, it wasn't fussy, and in was sized to fit a hefty lass. I began the project, and away I went. The main part of the body is finished. The first sleeve has been started. And so, one last confession: I started a sleeve, worked an inch and a half, decided I had done it all wrong, unravelled and started again, worked three inches, thought I had done it wrong AGAIN, unravelled and finally started a third time, realising I had been doing it right the entire time. I should know to trust Interweave patterns and not my judgement late at night. I'm not sure if I'm exhibiting a mental block about self-worth, a neurotic perfectionism, or a maybe just a really, really deep psychosis. 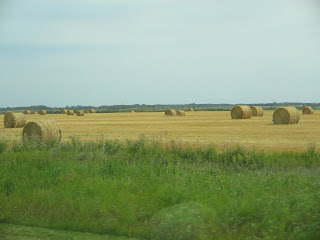 I wonder if those big bales of hay are ever "just not right" and someone says "no, no, no let me try that again". Or, "I think that one needs to move to the right", maybe, "People, People, we need a odd number, bad feng shui you know". I'm sure glad I'm not a farmer. In my next post I'll tell you about our trip out to Souris.